The Colbert Report finale song “Holland, 1945”: Did Colbert pay tribute to his dead brothers with Neutral Milk Hotel in the closing credits? For his closing credits, Colbert chose “Holland, 1945” by Neutral Milk Hotel. After almost a decade on the air, Stephen Colbert brought The Colbert Report to a close Thursday night. 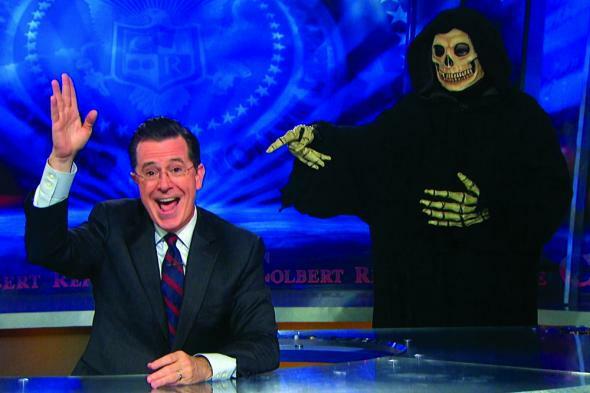 For the final show, he brought back many familiar segments, including “The Wørd” and an abbreviated edition of “Cheating Death with Dr. Stephen T. Colbert, D.F.A” in which Colbert finally managed to overcome death. Where their bodies once moved but don’t move anymore.